After weeks of late-season snowfall and subsequent thaw-induced flooding, it’s no wonder so many are ready for a break. Why not treat yourself to more than one? School calendars and cold temperatures don’t need to define or confine springtime excursions. Make the Woodson Art Museum your go-to spot for frequent and extended breaks throughout the spring. By scheduling multiple micro-vacations, you can be a tourist in your own hometown and invite friends and family to Wausau for weekend getaways. Cut Up/Cut Out features intricately cut paper and other unexpected materials – from vintage road maps and leaves to a car tire and a saw blade – offering plenty to pique curiosity and spark contagious creativity. The spirit of Slow Art Day – a worldwide art appreciation effort designed to encourage taking time to view and reflect upon artwork – can be applied anytime. For an introduction to the idea, visit the galleries on Slow Art Day, Saturday, April 6, Noon-1 pm and look closely at a few Cut Up/Cut Out artworks of your choosing. Then share your observations with others during a discussion with Museum volunteers, 1-2 pm. You can learn more about selected artworks on view by checking out the audio tour and picking up an Activity Guide, too. Trust your instincts and let delight be your guide. With a nod to organizing consultant Marie Kondo’s living-space advice, choose artwork that sparks joy. Here’s a sampling. 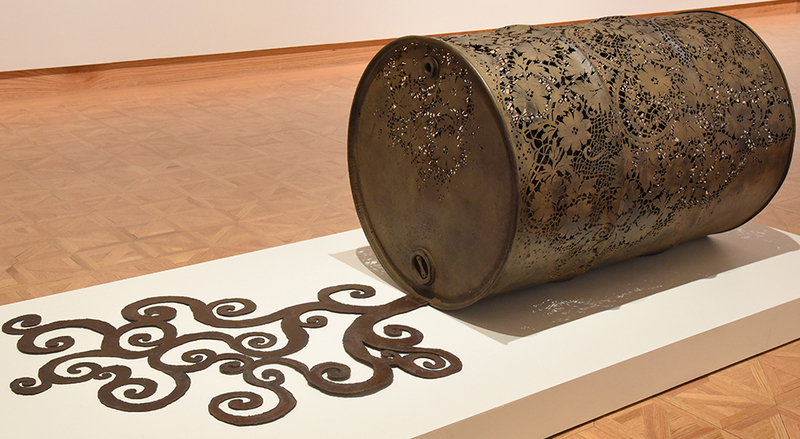 Cal Lane uses her experience as a welder to transform an oil barrel and steel ammunition boxes into lacey marvels. Karen Margolis incorporates maps, symbolizing destinations and arteries of the human circulatory system, and then uses a soldering iron to burn holes that are designed to convey ideas about creating new routes and connections. During the 2019 Wisconsin Governor’s Conference on Tourism, March 17-19, Tourism Secretary Sara Meaney extended an invitation for all to embrace a “curiosity challenge” by traveling to experience something new. 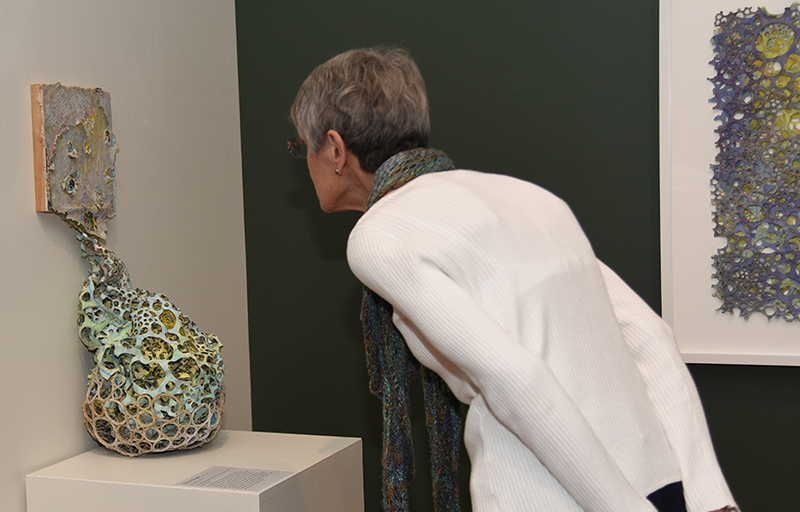 Meet that challenge through getaways to the Woodson Art Museum for multiple, cut-above visits. Be a tour guide for friends and family visiting Wausau, prioritize weekend family outings, date nights during Night Out @ the Woodson on the first Thursday of each month, and solo lunch-hour visits. 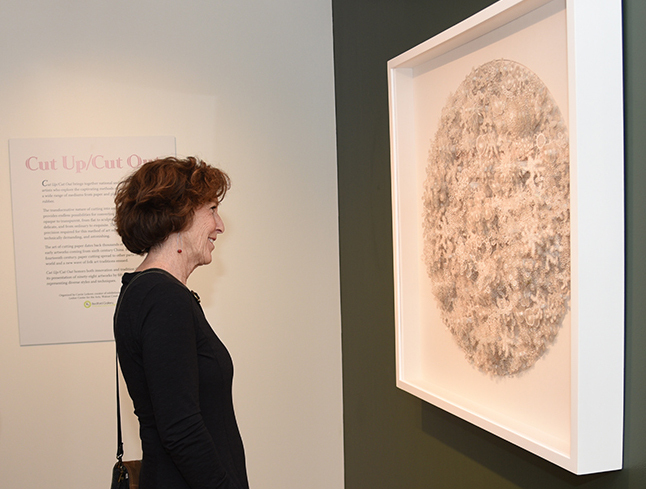 Cut Up/Cut Out, organized by Carrie Lederer, curator of exhibitions, Bedford Gallery, Lesher Center for the Arts, Walnut Creek, California, remains on view through June 2. 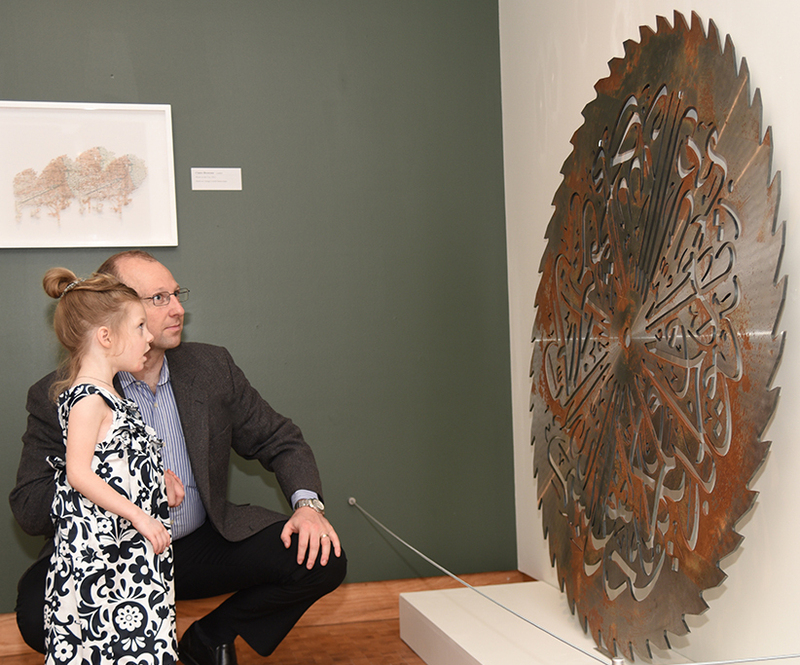 Offering always-free admission, the Woodson Art Museum is the perfect place to visit – soon and often – for rejuvenating breaks sure to foster new connections with art and with others, this spring and beyond.